New Listing Tucson AZ – 1798 E Pusch Wilderness Dr. This custom home is located in the gated community of La Reserve in the heart of Oro Valley AZ. Easy access all Oro Valley amenities, shopping, dining and activities. This stunning custom built Santa Fe home will meet the needs of year around residents or lock and leave “snow birds”. This stunning home offers Bosch Kitchen Appliances, double convection oven, 5 burner gas stove with pop-up down draft and dumb waiter to bring items up from the garage to the kitchen area. 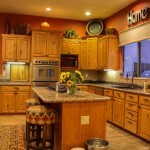 Kitchen has granite counter tops, granite sink and modern stainless faucet. Just off the kitchen is a front patio with views of the Oro Valley and Tortollita Mountains. Evening sunsets make this a comfortable place to relax and discuss the days events. The large master bedroom opens to the very private rear patio area with spa and fire pit. The recently upgraded master bath has dual sinks, a luxurious soaking tub, extra large walk-in shower, heated towel rack with programmable timer and access to a large master closet. The extra large laundry room offer lots of cabinet and counter space. This stunning custom home sits high above the street and has great views of the Oro Valley lights and the Pusch Ridge View of the Catalina Mountains. 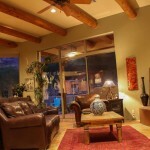 Located in the heart of Oro Valley and close to all amenities and attractions. Enjoy living in a home that captures the essence of the SW with Vega beams, beehive fireplace, and authentic Mexican & saltillo tile flooring. Had a hard day golfing? 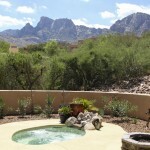 Take a dip in the spa, relax and be captivated by the Pusch Ridge mountain views. Tired from a long day shopping, use the dumbwaiter to bring your treasures from the 3 car garage. To end that busy day, enjoy ALL the updated features in the master bath followed by a cocktail on the front patio deck while another glorious sunset captures the reason why you bought this home! Questions about this home or other new listings Tucson, the Tucson Real Estate Market or Tucson Homes for Sale? Call Us 866 316 5575 OR complete the CONTACT FORM and we will get right back to you!